It’s been a while since I’ve been looking for Warhammer V2 characters cards on the web without finding something that suits me. So, I created a group of adventurers to satisfy my needs. Nothing more practical than having a nice little set of PC’s pre-fired on hand to get out master oneshots at the local RPG club. I wanted these cards to be as practical as possible so I opted for an A5 format. On the front I wrote a light background that link each character to the group, the characteristics and I added an illustration from the rules book to help the player make his choice. On the back I chose to put the description and the effect of the talents for each character as well as a small table of the different types of possible attacks with their costs in “action”. Of course, I also realized the little spellbook of common magic(Occult) essential for the spellcaster. 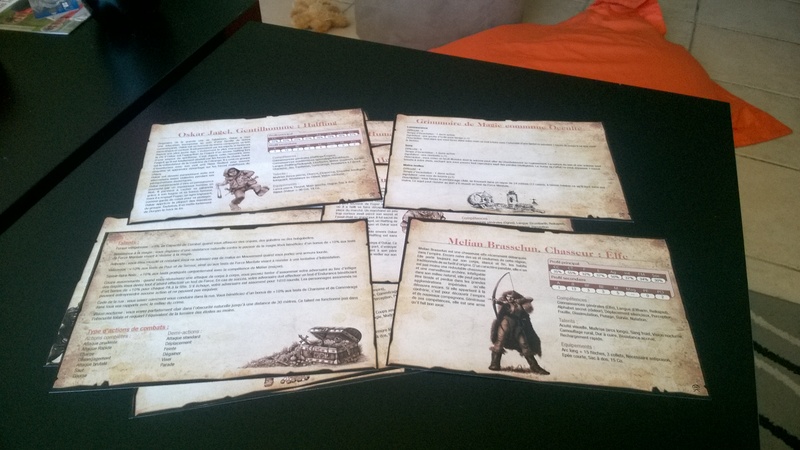 Here is a small picture of the printed cards. I plan to plastify them for increase their durability. The Brotherhood of Strange is a group of 10 characters, at the end of their first career, ready for adventure. The creation of the Brotherhood is at the initiative of a rich Halfling in order to investigate the strange phenomena related to the Chaos. This group consists of: a Halfling Gentleman, a Human Bounty hunter, a Human Mercenary, a Dwarven Outlaw, an Elf Witch Apprentice, a Human Barber’s Surgeon, an Ogre bodyguard, a Dwarf Trolls killer, an Elf hunter and a Halfling Trickster are waiting for you to live memorable adventures. I am sure that this group will be useful to more than one Game Master and it is therefore a pleasure for me to make it available to all. I would like to thank Stéphane Furic and Sylvain Lambert for proofreading and corrections, Theodore de Marliave for helping to write the background of the Elf Hunter and the Halfling Trickster. Download the PDF file (10 characters + spellbook). PS: The file is in only available in French. I could easily create an English one if an English player is motivated to do a translation. Feel free to contact me if it’s you. Tes bébés vont évoluer dans le Vieux Monde au Forum du jeu de St Denis à la Réunion ! EH EH! Trop la classe. Merci pour ton petit message. J’espère que ces petites feuilles recto-verso auront du succès et que les personnages plairont a tes joueurs.